Hip-hop did much to strip shame from poverty, but with songs like “Whitey on the Moon”, where he juxtaposed high health care bills, rat-infested apartments and late rent payments with space race budgets, Gil Scott’s songs restored humanity to America’s inner-city poor. When fans found out last year that Gil Scott Heron was booked to play in Tel Aviv, they formed a campaign to show Heron that to break the cultural boycott of Israel would be a violation of the principles he had upheld his whole life. To his great credit, he cancelled the gig. 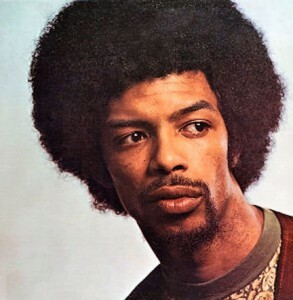 Gil Scott Heron will be greatly missed, but his music and words will continue to inspire and educate. If you haven’t got his albums yet, you need to catch up quick! In the meantime, here are a few highlights. More wisdom in these 2,000 words than most people receive in five years of secondary school! Massive respect to Raghav for transcribing the lyrics (I don’t even want to think about how long it must have taken!). Would we fight people just like us? How could I knock the hustle to get by? How do you think I ate as a child? Oh that’s right, that’d be your kids! Where do you think you get your nine? You think you were always livin’ in the hood? Is it difficult to figure out how you would then end up feelin’ about it? How they gonna fill a prison when materialism is no longer our religion? What do you think we got now in Britain? As long as rich kids ain’t dying its fine! Tell me was Marcus Garvey soft? Well? Was Mohammed Ali soft? Nah, Nah I think not! Who benefits from us movin’ the food? Why is this something you cannot equal? Don’t tell me that it’s too hard! Who trained you to believe that you’re inferior? It was a documentary on BBC! Huh, does that make you all happy? It mean that much to em’, it’s a movement! Stuck on the block, READ, READ! Sittin’ in the box, READ, READ! If we knew our power, we would see what everybody sees, that we’re rich already! I’m off, back to the study! 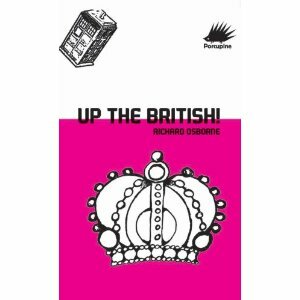 Right, well summarising Tim Wise’s White Like Me in 15 tweets went reasonably well, so I figured I’d try something similar for another very useful book: ‘Up the British’, by Richard Osborne. This book is a must-read for anyone interested in the concept of ‘Britishness’ and British identity. Here is the summary I tweeted earlier. That’s followed by some of the best quotes from the book. The ideological defence of the British Empire was always based on the idea of the racial, cultural and moral superiority of the British. The empire fostered the British psyche in ways that still shape our reactions, thoughts, myths and means of thinking about ourselves. The idea of Britishness is a deliberately constructed brand devised to fool workers into identifying/uniting with their class enemies. Trying to understand Britain without understanding the empire is like trying to understand the US without understanding slavery. Britishness has been a highly conflicted identity since the colonies proved they were much better off without British rule. The sense of superiority instilled in the white working class during times of empire is manifested now in terms of rising fascism. British are addicted to nostalgia – looking to a perfect time when our superiority was beyond question. Meanwhile we ignore the real history. The aristocratic arrogance and bizarre traditions of the Royal family help reaffirm Britishness, and therefore the Royals are very popular. Expansion of British Empire was based on naval strength, thus the pomp and glory of the Navy features highly in British tradition. We have myths (like Francis Drake being a great guy) that, through endless repetition, become collective memories. The fantasy of the idyllic British village grows stronger, even as new hypermarkets are constructed at an alarming pace. Thatcher appealed to Britishness whilst selling off the state’s assets to multinational corporations. ‘Tolerance’ is part of the British identity, but strangely it doesn’t extend to immigrants, Muslims or radicals. Britishness includes a profound distrust of immigrants, yet immigrants have been essential to Britain’s cultural and intellectual development. Immigrants are feared, as they threaten the fantasy of ‘Little England’, and of course because of the ingrained belief that they are inferior. Britain is one of the most unequal societies in the western world but its self-image is one of fairness and contentment. Britain is a repressive society, increasingly reliant on hi-tech surveillance & armed police, and yet its self-image is freedom & democracy. Churchill fulfils the national need for a strong hero figure. Nobody seems to care that he was a rabid Tory, racist and hater of the working class. Underneath the national identity, there is an underlying subdued class war that’s brought to light only occasionally – eg Chartists, General Strike, Miner’s Strike. A new culture needs to be built by digging into the past, confronting the demons, giving up racism/supremacy, and finding a place in the world. “The difference between stories and history is that the former begin ‘Once upon a time’ and the latter begin ‘In the time of’”. If you want to read the whole book (it’s pretty short – only about 140 pages), here it is on Amazon UK. The ‘Celtic warrior maroon from yard’ drops pure knowledge for the block over a hard grime beat. Four minutes of mindblowing skills and wisdom! Did you create the condition that you were raising your kid in? If you didn’t, who did it? Is it really for the hood if our oppressors like our lyrics? Six minutes of inspiration and sense from Logic! Some very deep points here. A must watch for the cultural revolutionaries! 11 May 2011 marks the 30th anniversary of the untimely death of Robert Nesta Marley – probably the most significant cultural figure of the 20th century. I can’t think of anybody else who has reached such levels of popularity and influence whilst consistently putting forward a message of resistance to oppression. Undoubtedly, Bob’s image has been somewhat sanitised and pacified by corporate forces who like to portray him as a “chilled out guy with a great voice”. But you only have to only have to look outside Europe and North America to see the profound and enduring effect Bob Marley had on the downpressed masses of the world. Marley is still loved by the sufferahs all over the world, not simply because of photos of him burning the holy herb, but because of the hope, pain, love and inspiration of his music and his words. In Africa and South America, Bob is a hero and a teacher. Indigenous Australians keep a flame burning for him in Sydney. He is revered by many indigenous Americans. Bob Marley always put forward a deeply humanistic vision of the unity of all peoples (“I only have one thing I really like to see happen – I like to see mankind live together – black, white, Chinese, everyone – that’s all”). Yet he was also keenly aware of how much of the system of empire, colonialism and white supremacy had been built on the oppression, enslavement and murder of Africans. 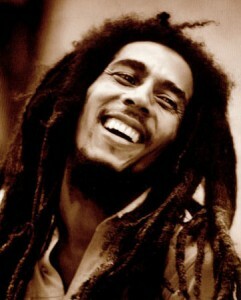 Bob loved all humanity, but he represented for the oppressed, and for Africa first and foremost. Another song that represents Bob’s position on the frontline of struggle against oppression at the end of the 70s and the beginning of the 80s is ‘Zimbabwe’, which was written specially for that country’s independence celebrations. Rest in power, Bob Marley! Pure positive vibes from UK legend Skinnyman! As usual, Skinny’s reppin’ for the youth, telling you the truth in the only way he can be sure you’ll listen to it – in music. Great video as well, including footage taken at an anti-BNP protest. At the end he also makes a very deep point about the history of black music as freedom music.